Everyone's favorite childhood sandwich gets a deluxe candy makeover in this recipe for homemade Peanut Butter and Jelly Chocolate Cups! It's amazing how simply adding a layer of fruity jam or jelly on top of your homemade peanut butter cups makes them extra-special. Don't miss the photo tutorial showing how to make chocolate cups for step-by-step assistance during that part of the recipe. To prepare the chocolate cups, melt the chocolate-flavored candy coating in the microwave. Melt it in short 30-second bursts and stir frequently so it doesn't scorch. Using a small pastry brush (or clean paint brush), brush the chocolate up the sides of the small candy cups. Try to make your coating as even as possible, and swirl the cups upside down to help distribute the chocolate. Hold the cups up to the light to determine whether there are any translucent spots that did not get covered adequately, and if there are, paint them again with chocolate. Set the remaining melted chocolate aside to use later. If you have questions, refer to this photo tutorial showing how to make chocolate cups. Let the chocolate cups harden completely in the refrigerator or at room temperature. When the cups are set, prepare the peanut butter filling. Combine the peanut butter, powdered sugar, vanilla, and salt (if using) in a bowl, and stir them together vigorously until everything is well-mixed. If the mixture seems a little stiff, add 1-2 tablespoons of milk and stir it in until it is the texture you desire. Scoop the peanut butter filling into a pastry bag fitted with a 1/2-inch round tip, or a large zip-top plastic bag with a hole cut in the corner. Pipe the filling into each chocolate cup so that it comes up a little more than halfway. Wet your fingertips and press down gently on the filling to smooth away any peaks. Spoon the jam into the cups on top of the peanut butter, leaving a small margin at the top for the top layer of chocolate. Before you top the cups, finely chop the salted peanuts and freeze-dried fruit and have them nearby. Re-melt the chocolate candy coating until it is fluid. Spoon a bit on top of each cup, smoothing it to the edges to create a chocolate “seal” over the jam. 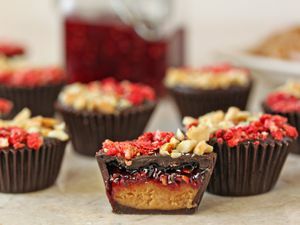 While the chocolate on top is still wet, sprinkle the tops of the cups with the chopped peanuts and freeze-dried fruit. Refrigerate the cups to set the chocolate, for about 20 minutes. Store Peanut Butter and Jelly Chocolate Cups in the refrigerator in an airtight container for up to two weeks. Allow them to come to room temperature before serving.